The OC60D digital liquid dielectric testing equipment accurately and reliably test the dielectric strength of insulating liquids used in a wide variety of electrical apparatus up to 90kV AC. The safe and easy operation has made Hipotronics OC series the industry standard for decades. The OC Series is designed to meet testing specifications in all parts of the world and test cells are available for ASTM D877, ASTM D1816 and IEC 156. The rugged yet lightweight and portable design ensures years of trouble-free operation both in the field and in the laboratory. The Hipotronics OC Series has three pre-programmable rates of voltage rise and automatic termination of voltage upon sample breakdown. A digital memory kilovoltmeter automatically retains the breakdown voltage reading until it is manually reset. Output voltages to 60kV AC. Tests insulating oils per ASTM and IEC standards. Automatic high voltage shutdown at breakdown. Meter accuracy ±2% of full scale. One piece construction with safety interlocked high voltage section. Multi-purpose - because of its compact design its easily useable in the field as well in the factory. Sturdy and reliable - the OC series of testers have a long and trouble free life, proven by over 40 years of industry wide use. 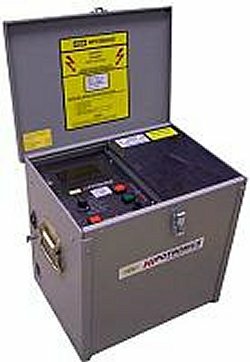 Safe and easy - The interlocked high voltage section and integrated controller allow your operators to test safely and easily. (0.5-inch), molded epoxy case, and 2% accuracy at full scale.